When Volume started as ‘magazine to go beyond architecture’ in 2005, the world was a different one. There was a lot of attention for the spectacular in architecture, for instance, and little for where society was going in relation to architecture: the urgencies and opportunities architecture could and should engage with. Since, Volume explored a wide variety of topics and terrains, each time looking for the added value of architecture. So, what is the situation today? in this issue Volume focuses on current dilemmas (young) architects are confronted with, both in education and in setting up their office. It’s less about ‘going beyond’ as such, and more about impact and repercussions. With contributions by: Rem Koolhaas, Leonardo Dellanoce, Mark Wigley / Beatriz Colomina, Bengin Dawod, Winy Maas, Gabu Heindl, Benedict Clouette, Timothy Moore, Anne Feenstra, Nick Axel, Jose Muñoz-Villers, Ole Bouman, Jeffrey Inaba, Brendan Cormier, Ute Meta Bauer, James Taylor-Foster. Volume 50 – Beyond Beyond includes Total Space, a 32-page insert produced in collaboration with the Jacob Bakema Study Centre and designed by Metahaven, on the notion of ‘total space’ as introduced by Jaap Bakema in the 1960s and what it means in the digital world of today. 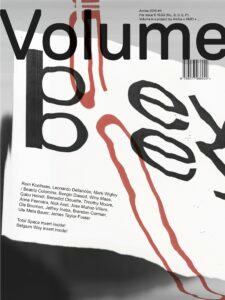 Volume 50 – Beyond Beyond also includes Doing It the Belgian Way, a 32-page insert produced in collaboration with KU Leuven/Sint-Lucas School of Architecture and designed by Julia Neller, on educating tomorrow’s architect.